Big Bend Bluebonnets Wildflowers- Big Bend bluebonnets in the Big bend National Park as the wildflowers climb up the mountain sides a rare sight. The bluebonnets on this ridge had the Santa Elena Canyon and Cerro Castillian as the distant landscape. There is nothing like a mountain back drop for your bluebonnet images. Bluebonnets were thick on the mountian sides off the ross maxwell scenic drive so we stopped to get some roadside photos and the next thing we know we have walk a mile up the mountain side. It was one of those moments when you look in another direction and there are even more blueboonets on another hill side or along a ridge that you just have to get too. It ws an amazing site. There were so many to be seen and such a short time to get the photos of the bluebonnets on our trip. There is just something about being in the presents of mountain and desert landscape and throw in some bluebonnets and it brings the kid out in you it is kind of a magical event. This species of lupine grows taller than other texas bluebonnets they are several feet tall and there stems and seeds are much larger than other bluebonnet plants. This is what makes them a little more hardy for the harsh weather conditions in west texas. Some of the comman name for these bluebonnet are the big bend bluebonnet, big bend lupine, chiso bluebonnet, and havard bluebonnet to name a few. Regardless of what you call them they are a wonderful site to see in this desert landscape. We have heard about how great these bluebonnets have been in the past but this is the first time in ten years we have seen them like this. In the past we only found a few small patches along the roads. We are glad we made the eight hour drive down to catch them before they are gone. Big Bend Bluebonnets – Big Bend bluebonnets panorama in Big bend National Park as the wildflowers climb up the mountain sides. The bluebonnets on this ridge had the Santa Elena Canyon and Cerro Castillian as the distant landscape. There is nothing like a mountain back drop for your bluebonnet images. Bluebonnets were thick on the mountian sides off the ross maxwell scenic drive so we stopped to get some roadside photos and the next thing we know we have walk a mile up the mountain side. It was one of those moments when you look in another direction and there are even more blueboonets on another hill side or along a ridge that you just have to get too. It ws an amazing site. There were so many to be seen and such a short time to get the photos of the bluebonnets on our trip. There is just something about being in the presents of mountaiin and desert landscape and throw in some bluebonnets and it brings the kid out in you it is kind of a magical event. This species of lupine grows taller than other texas bluebonnets they are several feet tall and there stems and seeds are much larger than other bluebonnet plants. Some of the comman name for these bluebonnet are the big bend bluebonnet, big bend lupine, chiso bluebonnet, and havard bluebonnet to name a few. Regardless of what you call them they are a wonderful site to see in this desert landscape. We have heard about how great these bluebonnets have been in the past but this is the first time in ten years we have seen them like this. In the past we only found a few in small patches along the roads. We are glad we made the eight hour drive down to catch them before they are gone. 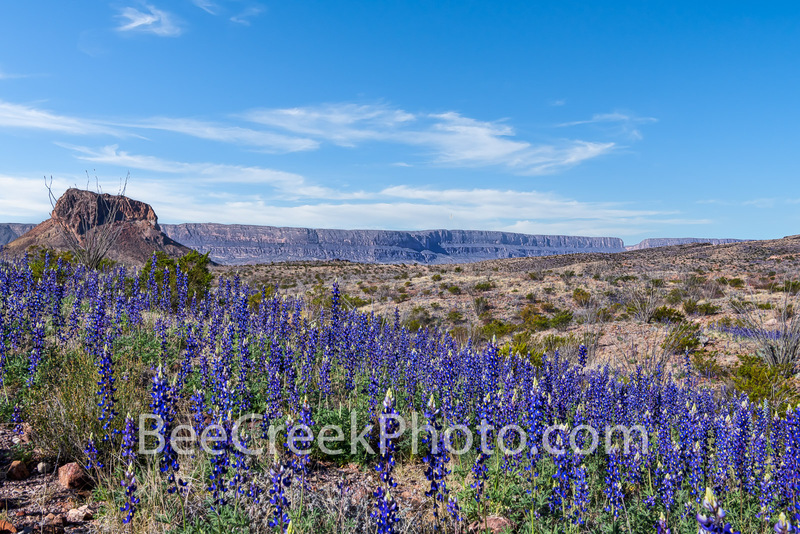 Posted in Photo of the Day and tagged big bend, Big Bend Bluebonnet, Big Bend Lupine, big bend national park, Cerro Castillian, Chisos Bluebonnet, desert, Havard Bluebonnet, image of bluebonnets, lupine, mountains, pictures of bluebonnets, ross maxwell scenic drive, Santa Elena Canyon, texas, texas bluebonnets, wildflowers, wildflowers of texas on March 7, 2019 March 8, 2019 by Bee Creek Photo. ← Previous: "Chiso Mountains Overlook"